Original Builder: Mr. Jonathan Nichols & Colonel Joseph Wanton, Jr.
Named in honor of the English monarchs (George I, II, and III), who ruled for most of the 18th century, the “Georgian” style was popular in both England and the American Colonies. Georgian style houses can be recognized by a symmetrical façade, an elaborate front door entry and roof balustrade, and the use of classically inspired ornamentation derived from ancient Roman iconography. The style was brought to America from England around 1700 through the publication and dissemination of architectural design books. The publication of these handbooks, such as James Gibbs’ A Book of Architecture and Batty Langley’s The City and Country Builder's and Workman's Treasury of Designs, coincided with a period of extraordinary growth in population and building in the colonies. For colonists seeking the latest in technology and fashion, these publications, available through private booksellers and libraries, served as important “how-to” guides. Hunter House (1748) is a typical example of Georgian style architecture. It has a symmetrical five-bay façade, with two bays on either side of the central doorway, and chimneys at either end. The gambrel roof was originally covered in wood shingles, typical of the period, but was replaced with a slate roof in the 1870s. The exterior of the house is covered in pine clapboards, which were widely available at the time. The use of hardwoods, such as oak, was typically reserved for shipbuilding. The focal point of a Georgian exterior was the front door. 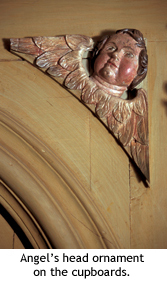 At Hunter House, the paneled front door is framed by pilasters that support an elaborately carved broken-arch pediment. At the center of the pediment is a pineapple, the colonial symbol of hospitality. The arrangement of the interior spaces in a Georgian house reflected the symmetry of the exterior. Hunter House has a central hallway, or passage, that extends from front to back and allows access to the four first-floor rooms (two on either side of the passage). The two rooms facing the street were used as parlors, with one being more formal than the other. The most formal chamber occupies the northeast corner of the first floor, and is one of the most important mid-eighteenth century rooms in America. In the 1940s, the contents of this room were slated to be dismantled and sold, but it garnered the interest of concerned citizens who joined to save the house and consequently formed the Preservation Society in 1945. Usually square or rectangular in shape, the formal chamber of a grand Georgian house was focused on the fireplace wall decorated with columns, pilasters and other ornament, with cupboards for the display of valuable porcelain. In the 18th century, the finest chambers were fully paneled in wood from floor to ceiling. Newport houses of the period were known for the bold proportion of their framed paneling. The walls of the formal chamber at Hunter House are clearly defined by a raised architectural molding called “bolection.” Framed bolection moldings appear between the windows and over the fireplace. Flanking the windows, built-in shutters fold into the wall panels. Cornice moldings break out over the windows to form a lintel, adding further dimension.